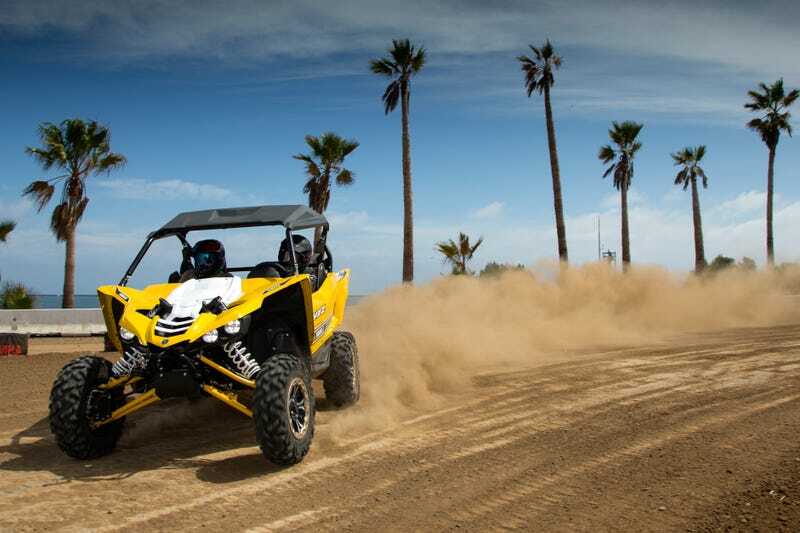 Yamaha’s newest SxS, the YXZ1000R, is not for everyone. It’s not for the faint of heart. Not for the timid. Not for the weak. It is for those of you (us) who want to go really fast, really far, and who want to jump not just some things, but all of the things. Its all-new 998 cc, triple cylinder motor (which we’re told makes 110 hp or so) has plenty of low and mid range torque, but also a fairly high 10,500 rpm redline. The YXZ1000R is the first SxS to have a fully manual, 5-speed sequential shift transmission - and it’s mated to a direct drive transmission. No paddles, no slushbox, and no more belts. It’s also more efficient, providing 15-20% more power to the rear wheels. 2WD, 4WD, and 4WD with full locking differential mode mean you can drift or crawl your way around or over just about anything. The clean air intake is mounted centrally and high so that it gets a maximum amount of clean air - which is filtered through a dual element air filter which allows for longer maintenance intervals and is easy to clean out in the field. The Fox 2.5 Podium Shocks® tuned for the perfect blend of sport performance and comfort. They provide 16” of travel in the front and 17” in the rear, and are adjustable for hi and low speed compression, rebound, and preload. They also have Fox’s Bottom Out Cup technology, which adds additional support at the limit of the shock. The A arms the wheels are mounted to are attached in a way that, when they hit a rock or whoop, they are pushed up and back instead of up and out laterally. This rocks the SxS forward/back instead of side to side, which both helps keep the power down and improves durability while also improving straight line tracking. Everything was designed to take a beating. This is Yamaha’s first seat that can be adjusted without tools, because they weren’t willing to use designs like their competitors which could become dislodged. Likewise, this is Yamaha’s first adjustable steering wheel. Everything from the chassis to the transmission to the brakes to the buttons and toggles in the interior have been designed to withstand your worst. The 2016 Yamaha YXZ1000R goes on sale next month in the 60th Anniversary Special Edition yellow for $21,599, followed this December by the Blaze Orange colorway for $19,799 and Racing Blue/White for $19,999. Unfortunately, the launch yesterday in San Pedro, Calif., was shared with dealers from all over the country - which meant there were way too many people and not nearly enough trust in the group to go around. Guess this just means we’ll have to get a loaner and take it to the trails and dunes for ourselves. Just another day at the office, all for you, my beloved readers.